Howard D. (Jake) Jacobson, who was born in Iola, Kansas in 1949, grew up in Iola and then El Dorado, Kansas. Jacobson attended Butler County Community College in El Dorado, subsequently transferring to Fort Hays State University (Hays, Kansas) where he earned a B.A. degree in 1973. Studying with Professor Jim Hinkhouse, he received his M.A. in Sculpture in 1974 from Fort Hays State. He started his teaching career at Hutchinson (Kansas) Senior High School where he taught ceramics for six years and also at Hutchinson Community College. Jacobson returned to Fort Hays State and completed his M.F.A. degree in Ceramics in 1982 under Professor Darrel McGinnis. After a one-year temporary appointment as Instructor of Ceramics and Life Drawing at Kearney State College (now University of Nebraska at Kearney), Jacobson taught at Midland Lutheran College (now University) in Fremont, Nebraska for four years. Returning to Kearney to join the Faculty of the Art and Art History Department in 1987, he continued to teach there until retiring as Professor Emeritus in 2014. Over his long teaching career, he has encouraged a vast number of students, many of whom continue to create their own work while others also teach art. Among his awards, Jacobson received a 1991 Nebraska Arts Council Individual Artists Fellowship. In 1992 he was selected as one of nine artists featured in a Nebraska Educational Television production titled “Is It Art?” which continues to air throughout the United States. In 1995, he was included as one of the artists in a series of lectures at the Sheldon Memorial Art Gallery (now Sheldon Museum of Art), Lincoln, Nebraska, on contemporary Nebraska artists moderated by then Omaha World-Herald art critic, Kyle MacMillan. 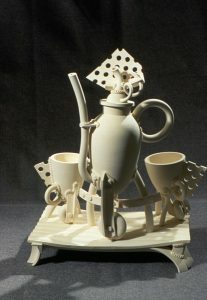 From 1996 to 2001, Jacobson was guest curator for three national ceramics exhibitions at the Museum of Nebraska Art in Kearney: Rendezvous, Rendezvous II, and Rendezvous 2001. Jacobson invited nationally-recognized ceramic artists to exhibit in each of the Rendezvous exhibitions. Each of these artists in turn invited another ceramic artist to participate in the same exhibition. The concept of Rendezvous exhibitions was to bring together varied, high quality ceramics from across the United States. Jacobson has exhibited in numerous national exhibitions including: National Cone Box Show, University of Kansas, Lawrence, 1977; January White Sale, Lillstreet Art Center, Chicago, Illinois, 1982; What’s New in Clay, University of Houston, Texas, 1982; The Great American Bowl, Newport Art Museum and Art Association, Rhode Island, 1982; NCECA Juried Members Show, Atlanta, Georgia, 1982; Vessels Aesthetic, Taft College Gallery, California, 1983; Wichita National, Wichita Art Association, Kansas, 1985; The Clay Cup, Southern Illinois University, Carbondale, 1986; 1st Annual Monarch Tile National Ceramic Competition, San Angelo Museum of Fine Arts, Texas, 1986; Contemporary Teapots 200 Exhibition, Springfield Art Association, Illinois, 1987; Form and Function: Teapots, Craft Alliance Gallery, St. Louis, Missouri, 1988; White Heat: An Exhibition of Porcelain Ceramics, University of Nebraska-Lincoln, 1989; Ceramics Now, Downey Museum of Art, California, 1990; The Teapot Show, Mariani Gallery, University of Northern Colorado, Greeley, 1994; Ceramics USA, SOVA Gallery, University of North Texas, Denton, 1996; Handle, Spout, Story, Shrine, University of Nebraska-Lincoln, 1996 as well as many regional exhibitions including Nebraska Now: Jake Jacobson, Ceramics, a solo exhibition at the Museum of Nebraska Art in 2015. Images of his work have been included in several publications including the books Best of Pottery 1 and Best of Pottery 2. His work is included in public and private collections throughout the United States including The Donna Moog T-Pot Collection, Racine Art Museum, Wisconsin; The Edward Orton Jr. Ceramic Foundation, and the Museum of Nebraska Art. Jacobson continues to work from his home studio in Kearney, Nebraska, exploring new ideas for his forms and finishes. The Museum of Nebraska Art has three works by Jake Jacobson.